At our December Presbytery meeting last year, our presbytery council gave $100 to every church present with a challenge – multiply it for mission. That was the only instruction, and the sky was the limit. This is an old idea – Jesus told a parable about it in Matthew 25, where an owner entrusts various amounts of money to some servants as he departs, and comes back to find that two of the servants doubled what they were entrusted with, the third, out of fear, just buried it in the ground. The two who took risks to invest and multiply what they were entrusted with were praised and trusted with more, the one who simply buried it had even that taken away. So we were all anxious and curious to see what would come of this $100 challenge. As you know, $100 isn’t a huge amount of money, so we wondered how creative the churches would get. Well, we found out, and what stories were told! Below I would like to share two of the stories that were shared at the February presbytery meeting. As you read them, I hope you start to think about what just a small sum can truly make possible, when it is paired with passion, creativity, and faith. Next week I’ll post two more stories. Congratulations to these churches, who accepted the challenge! Isn’t it wonderful what God can do with just a few dollars, and lots of faith and creativity! Jesus should have told this story – in the parable the servants only doubled the money! Zion Presbyterian Church elders received seed money from the Minnesota Valley Presbytery to be used for a specific project. Although initially, session members were surprised and amused that this seemed the first time that Zion received any financial contribution back from Presbytery, they didn’t have a clue as to what kind of a project to thrust themselves into. Then the earthquake in Haiti happened. The pictures on TV, the devastation, and hardship of the people of Haiti affected not only Zion Presbyterian Church but the rest of our town as well. Zion Presbyterian Church and Bethel Reformed Church have been doing several events together over the last few years. In session meeting the idea arose to hold a Sub-sandwich luncheon with chips, a drink and a bar for the area residents to raise money for the people of Haiti. The $100.00 from Presbytery would be used as seed money for supplies for the project. Before the discussion went too far, the idea of partnering with Bethel Reformed in this project was raised and accepted. Bethel Reformed’s pastor and people readily joined the project. On Sunday in the kitchen the organizers and workers discussed how to split the funds (originally the idea was to split the proceeds down the middle.). The amount raised was $1461.00. When the folks from Bethel Reformed learned about the possibility of sending double the money for the Haiti people, they readily agreed that the best use of the money was to send it through Presbytery for the Haitian people. At Presbytery meeting a generous individual provided the added funds to double the proceeds. The total of the project is $2,922.00 plus $150.00 that came in later. God can do amazing things when his people believe, have faith and give! May his name be praised!! The Gift & Challenge were presented at the December Session Meeting — leading to much spirited discussion — one idea was put forward at the meeting was using it to “prime the pump” to partner with the new “Kids Against Hunger” site recently begun in Winnebago. This idea triggered a story from one of our elders, who had recently returned from a medical mission in Guatemala. While talking with residents there about hygiene / nutrition / and basic health care amongst children…one of the Guatemalans pointed to a wall of boxes, and said, “And when children are brought in that are close to starving…we use these.”…which turned out to be “Kids Against Hunger” packaged meals. While waiting for this and other ideas to be written up as proposals…a young church member approached me on Christmas Eve, asking if he could contribute…donating $250. Other gifts have begun to come in. With the additional emphasis on hunger issues in Haiti, the Kids Against Hunger Project (and potentially one other) were selected — we are inviting additional donations; will be hosting an all Church “packing” day following worship in the next month or so; and have placed challenge material in the sanctuary. Cambria Presbyterian Church took the challenge. The stewardship committee brainstormed over what charity we would like the money to go to and how we would increase it. We decided to let the congregation decide on which one after we had narrowed it down to 5. We wanted it to stay in the local area but not to go to one we support regularly. The congregation voted for hospice on the 31st of January. February 7th, we had a potato bake. The proceeds with the seed money came to 445.00 which is being divided between Blue Earth and Brown Counties hospice programs. At the December 1st Presbytery meeting held in Renville, each church present was given a $100.00 bill. We were challenged to use this in ways that it would multiply for the purpose of missions, locally and globally. The churches of Edgerton and Lismore were having a joint session meeting on Monday, December 14th. It was decided that our two churches would work together on this project, combining our $100.00 gifts into $200.00 to be used as the seed money. Proceeds then would be divided and sent to our respective Food Shelves in Worthington and Pipestone. Several events were then planned to add to our gift of now $200.00. We would take up a free will offering at each of our Annual Meeting potlucks held in January. 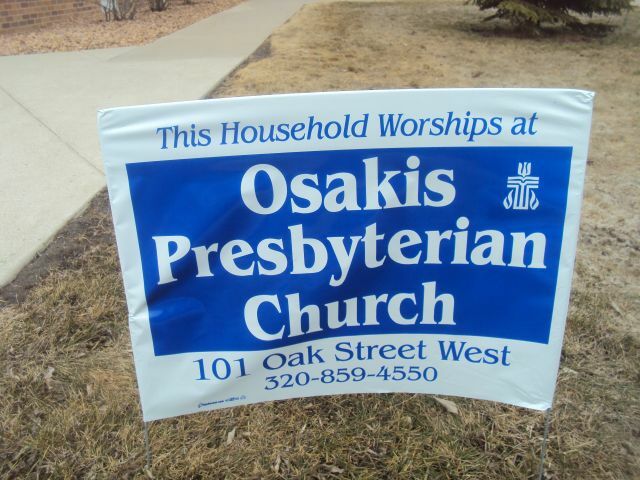 Then again in February each church would hold an additional potluck where a free will offering would be collected. In addition to this our weekly Lenten services would, at least for this year, offer a coffee fellowship time to follow the service with a free will offering taken at that time. There are also plans in the working for a catered meal to be served in March with the proceeds from that to go towards the $100.00 mission challenge. It was already a practice that the offerings taken during the Lenten services would be earmarked for our respective Food Shelves in Worthington and Pipestone. As mentioned above, the joint sessions decided that the funds collected from all of these events would be used to multiply the $100.00 that each church had initially received and would then be given to our respective Food Shelves in March when they, the Food Shelves, would match the funds given to them. The Lismore church session also voted to take $200.00 of what they had or would receive to donate to the Haiti Disaster Relief Fund. Edgerton also is collecting funds for Haiti and when announced that we were doing so, one parishioner from Edgerton donated $100.00 that Sunday alone. I know that members of our two congregations have stepped up to the plate to help multiply our initial $100.00 gift through the giving to the Souper Bowl for Caring giving which our Lismore church collects, the potluck free will offerings, and the special gifts designated and used for Haiti relief. All in all I am proud to be the pastor of these two great congregations who truly know how to multiply all that God has given to them so that others may come to know the blessings of our Lord and Savior, Jesus Christ. The First Church, Saint Cloud, at the request of the Mission/Social Witness Committee, has given $200 as seed money to the Sewing and Textile Training Cooperative – a project of the African Womens Alliance or AWA. (note: the original challenge grant from Presbytery was doubled.) The purpose of the Coop is to empower Somali and Sudanese women living in St. Cloud to become financially independent in an attempt to provide basic needs of their families. The majority of Somali women are from refugee families. The program involves 6-8 women meeting in the church building on weekdays to work on sewing projects. They are in the process of purchasing 6 sewing machines, basic sewing supplies and storage containers. A volunteer sewing instructor will coordinate the program and classes will begin in late March. Items will be sold at local markets or e-commerce sites. The AWA functions under the umbrella of the Multi-Cultural Center of Central Minnesota. This project will get started soon because they have a grant from the Multi-Cultural Center (MCCCM) for purchase of sewing machines and a job description for a volunteer coordinator. The church can continue to help with providing basic sewing supplies. As we know of these needs, we will publicize then in our Tower newsletter, and who knows, the basic challenge grant may continue to grow! When we (United Presbyterian Church, Kerkhoven) received the $100 from Presbytery, our session had no idea how to use this money. Our confirmation class at this time was trying to get enough money to buy one goat through the Heifer International. This would cost $120. The Maynard Church would pay half, as they had a student in the class. A challenge was made to the men in our church to match the $100 from Presbytery so we could buy 2 more goats (with the $100 from Presbytery). They met the challenge and more. When the Maynard Church heard of this they decided to give their $100 toward a goat too. So we were able to buy 4 goats and 2 shares in a goat and sent a check for $500 to Heifer International from the Kerkhoven and Maynard Churches. The goats will not only provide milk but fertilizer for the family garden. They will reproduce and some can be sold to provide income. May our gifts help someone to become self sustaining and be a gift that literally keeps on giving and improve the life of another person. The receipt of the $100 challenge gift was discussed with the congregation at the annual meeting. A number of options were presented. At the January work meeting of the session, the decision was made to renew the emphasis on missions in the life of the congregation. We recognized there would be limitations and we could not be all things to all people. We would focus our attention on missions in two broad categories, local and non-local. Non-local would focus on three areas: Heifer International, Haiti earthquake relief and Presbyterian missions. We decided we would provide through Heifer International two water buffalo at the cost of $250 each. The $100 challenge gift would be applied to this project. So far, the congregation has given an additional $585. We have also given $455 to Haiti relief. Within these amounts is $61 from a project by our Jesus Gang (Sunday school). They drew some pictures that were made into note cards and sold to members of the congregation. We have also met our Presbyterian mission pledge for the year in addition to giving to One Great Hour of Sharing. We have been a little more creative in funding our local mission program. The men of the congregation served the women dinner on Valentine’s Day. One of our members wrote a musical entitled Noah’s Ark, The Complete Story. The choir along with some additional support presented this as a dinner theatre. These two projects raised a little over $400. To keep us focused on our mission projects we have inserted a minute for mission in our worship services. The most important result of the $100 challenge has been that missions has become the focus for ministry at the Dawson church. Our two churches were able to raise a total of $1,735.60. To this we each added the $100.00 given to us by the Presbytery for a grand total of $1,935.60. Lismore sent the following funds off accordingly: $400.00 for Haiti relief and $490.60 to the Manna Food shelf in Worthington. This would include the initial $100.00 given to us by the Presbytery. Edgerton sent the following funds off accordingly: $200.00 for Haiti relief and $845.00 to the Food Shelf in Pipestone. This also includes the initial $100.00 given to us by the Presbytery. Edgerton also is sending in food items as well. We all can be proud of what our two small rural churches have done to turn a small amount entrusted to us into something great and useful that will benefit many, many others at this time. Congratulations to our two churches and thank you very much. 1. I bought a card for someone celebrating their 50th wedding anniversary. 2. I put it with my own money and went shopping for school supplies. I dropped these in (a student’s) box at Econofoods. Her senior project is to gather school supplies and give them to Nicollet County Social Services. 3. I used my dollar to get the phone number for and call an old multi-millionaire friend to tell him about what Kids Against Hunger is doing with Haiti’s Port of Prince as a model for an “each one reach one” dream. Then I encouraged him to google Ashton Partridge to look at what he’s doing with solar panels. I did this because Dr. Partridge’s name came to me in a dream, and we were talking about him. Funny thing is I had never heard of it or checked it out before the dream. 4. I gave the dollar to the Salvation Army. 5. The combined $1.00 that each of us received grew to $200.00 and went to a Methodist Church in Mexico that had a special need. 6. We combined our dollars with a few of our own and bought items for the birthday box. 8. I gave it, with other moolah, to a friend who lost her job. 9. I multiplied it and mailed it to the Red Cross to aid Pakistan flood victims. 10. We added a check with our dollar and sent a card to a little girl who has recently had her fourth surgery due to brittle bone disease. Her parents are on a limited income and have had numerous expenses. 11. For just 31 cents Care provides a hot, nutritious meal for a hungry, hurting child. My dollar was the seed for a $30.00 contribution that will feed 97 meals to hungry children. 12. On a family outing to the North Shore our grandson wanted us to see the soup kitchen where he helped serve meals on a mission trip a few years ago (Union Gospel Mission – Duluth); how could we not take our dollars plus a few more and contribute to this mission effort. 13. I sent my granddaughter the dollar plus more dollars for school supplies and clothes because her father is unemployed. 14. I bought two red roses and a bud vase and gave them to a lady in a nursing home; she is recovering from a broken hip. 15. I added $9.00 to provide a birthday kit for a St. Peter child. 16. I sent it with additional $$ to my sister and brother-in-law in Eluthra in the Bahamas for mission work there as they fly to Haiti to help there, also. 17. I gave it to to VINE. 18. I gave it with extra money to the Mayo Clinic. 19. I gave it with extra money to the 2010 cancer appeal at the Mayo Clinic. Donating to this fund can save 5 percent more lives in just one year. 20. I bought a scratch ticket and gave the results to the church to be given to the food shelf. 21. Through ChildFund International (formerly Christian Children’s Fund) I sponsor two children in Africa – one in Mozambique and one in Zambia. With my dollar and more dollars, I sent a gift of money to the children’s communities for them to apply to a need. I recommend that people in our congregation consider sponsoring a child in a poor area of the world. The Mission Committee may want to sponsor a child as an outreach project. 22. We gave surprise flowers and a card to one of our grandma’s friends who is also our friend. 23. I gave it to VINE – along with a $30.00 check. 24. I added it to my contribution to the disabled veterans. 25. I visited a friend in assisted living and brought her home-made goodies. I sent another shut-in a “thinking of you” card. 26. I put my dollar in the McDonald’s donation box. 27. We donated our dollars to Kids Against Hunger. 28. A patient at the Clinic, with no gas in the car, needed to go to a dentist in Savage. I was able to give her the money for gas to get there from my family. 29. I took my dollar to buy a wedding anniversary card for some college friends. I then included $100 in the card because they’re experiencing some financial stress, and I sent it anonymously so they won’t feel obligated to repay me somewhere down the line. What a fun thing to do! 30. I had a nice pencil case so used the dollar and others to fill it with school items. Some local businesses had collections for needy kids. I was visiting on your Dollar Sunday. Thanks for the opportunity! 31. I purchased school supplies (25 of each – notebooks, crayons, rulers, pencils. I planned to send these to (a mission) Bangladesh. However, the post office was not able to send it to that area, and if they could, it would have cost over $200 in shipping, so I donated the items to Nicollet County Bank’s school supply collection box. 32. I added money and sent a donation to the Bella Voce Young Women’s Choir of Southeastern Minnesota. 33. Ever since I heard of microlending (giving business loans to entrepreneurs – mostly women – in developing countries) I’ve wanted to contribute. When I received the dollar on Sunday, I decided it was time to do something about that. I loaned the dollar, along with some money of my own, to a group of women who sell food in the Dominican Republic. They will use it to fund and expand their businesses. 34. Gave donation to Caring Bridge; donations ensure patients, family and friends receive healing, encouragement and hope. 35. I used my dollar to purchase a coin bank at the dollar store. I put all my spare change in the bank during August and then donated what I saved ($38.70) to the new regional pet shelter (BENCHES). 41. We bought a packet of white price stickers, put them on a bunch of unneeded household things and sold them at a garage sale. The attached $20.00 is the “tithe” from that sale. 42. I want to give $1.00 towards stamps for the deacons. 43. I shared it with the fellow who bagged my groceries. 44. Kids Against Hunger; food packed in Mankato and sent to needy children. One dollar feeds four children. On September 23 a speaker on such will be at the Wilds. 45. I donated it to the DNR at the State Fair. 46. I added some money to it and gave it to the Pakistan flood relief offering. 47. Our daughter-in-law, who lives in Cleveland, Ohio, is going on a Lutheran mission trip the end of October. They will be visiting the Children of Israel Orphanage on the southwest coast of Haiti, in the city of Les Cayes. We will be adding an additional amount to the money we received on Dollar Sunday and giving it to the Caribbean Children’s Foundation. Their needs are many, with a priority of rebuilding what was damaged in the earthquake. 48. I added $19.00 to the dollar and donated two bags of groceries to the food shelf. 49. I added $24.00 to the dollar and made a donation to Kiva.com. Kiva makes micro loans to individuals in underdeveloped countries to start self-sustaining businesses. 50. I gave my dollar for a forget-me-not from the DAV. “If you need some money, feel free to take some. I pinned my dollar on the sign. Over the course of the month, I saw as many as four dollars on the sign and, sometimes, it was empty. I did add four of my own dollars. 52. I bought a thinking of you card for my cousin who is in the Navy. 53. I bought a get-well card for Grandpa, who was diagnosed with bone cancer. 54. I added more $ and purchased items for a birthday bag. 55. I added to my dollar to make $100 and sent it to my sister’s church in Mexico. The custodian needed money for her daughter’s needs for school. 56. Added to make $100 and sent it to a Methodist church in Mexico. Another custodian needed to buy a hearing aid for her husband.